The honour of landing Delphi’s first fish of 2014 fell to David Duffy of Knockrooskey, Westport. Duff as he is commonly referred to by his fishing buddies would not by his own admission be a great river fisherman. 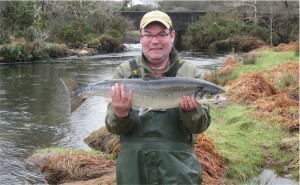 Having said that he was under the watchful eye of one of Delphi’s more esteemed anglers, Peter Joyce who was giving Duff a few tips on how to fish the river. It proved to be a most successful outing as David hooked and landed our first. 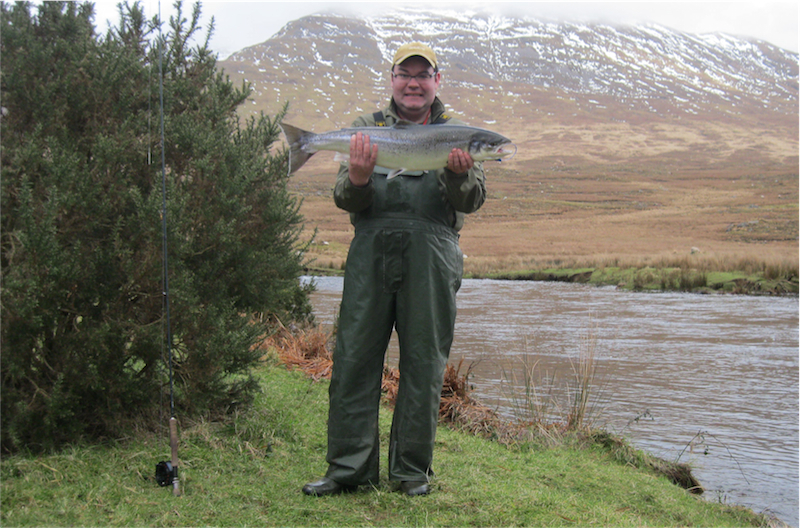 The fish weighed in at 11lbs14ozs and was taken in the Meadow pool on a Willie Gunn Waddington, using a 7wt single handed rod. The water was at 65 and it must be said that it was probably the nicest day that came since the season opened. There was actually a bit of nature in the day, which makes a huge difference this time of year, especially when the water temperatures are low. So well done to David and his mentor. Peter and myself did joke about the fact of how long he and I are trying to land that elusive first of the season. Peter has been fishing here 50 years and myself about 40. We’ll just have to wait till next year and try again. I must also spare a thought for the highly experienced Sutherland party of Angus, David Felton and Enrico Fantasia who tried hard over the weekend but to no avail. We have a few very keen anglers now for the next few days but we have availability from Sunday on if any of you out there want to brush off the cobwebs and get a fly in the water again.